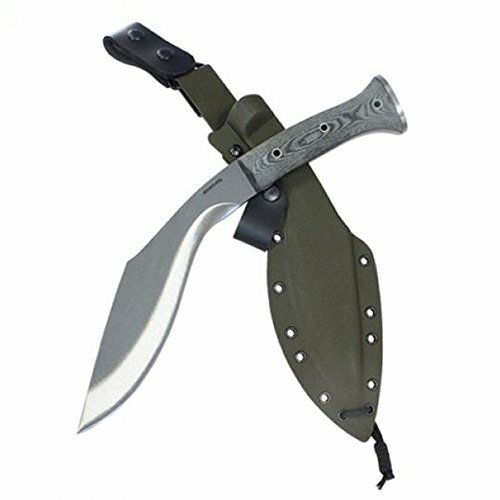 The K-Tact Kukri knife Army green is 14-1/2in long, with a 10in blade, and a blade thickness of 6mm. The blade is constructed of 1075 high carbon steel and is heat treated and annealed to 50-55 Rockwell C. Coated in a blasted satin finish. Micarta Phenolic handle enhances both the look and function while delivering indestructible performance. The Kydex sheath included is hand crafted with quality and pride, and is impervious to the elements. If you have any questions about this product by Condor Tool & Knife, contact us by completing and submitting the form below. If you are looking for a specif part number, please include it with your message.